This past Sunday, Hillary Clinton finally announced her presidential campaign. As of now, she's the only declared Democratic candidate for 2016. While there are several top possible contenders who she might go up against in the primary, including Elizabeth Warren and Andrew Cuomo, there's only one person who could lend the race his signature brand of jocular swagger, and that's Vice President Joe Biden. So — is he, or isn't he? 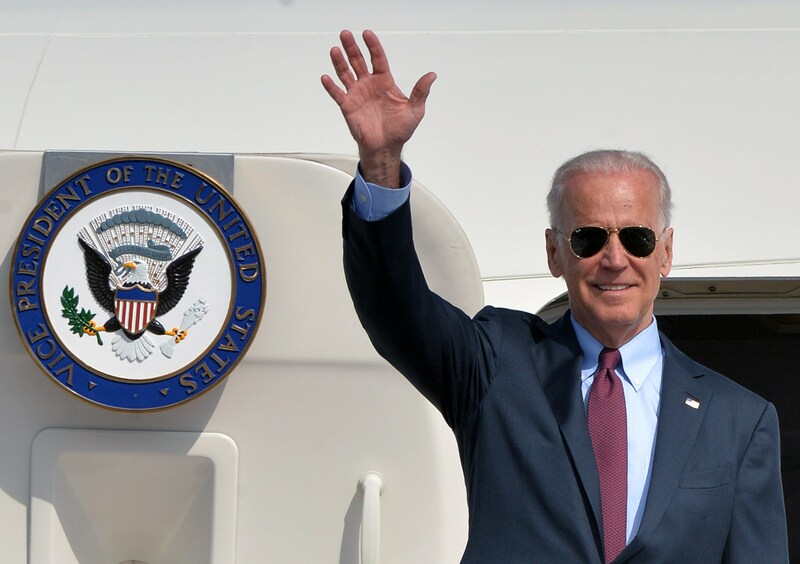 All we can do at this time is glean from Joe Biden's hints that he's running for president and hope that we'll be seeing a lot of aviators on the campaign trail. Now that Clinton is officially in the race, Biden's chances are modest at best, given that she's been a longtime Democratic favorite for the presidential nomination and the primary is basically hers to lose. However, if we've learned one thing about Biden it's that he's tenacious. Think about it: he's already run for president twice — once in 1988 and once in 2008 — he spent more than 30 years in the Senate, and he's been the president's second in command for the last six years. The guy knows his stuff, and this wouldn't be his first rodeo. Whether or not Clinton's nomination is inevitable, there's reason to believe Biden wouldn't still give it a go. And if his steely resolve isn't enough, then there are also the numerous hints he's dropped over the past months. He Told CNN "There's No Reason Not To"
In February, Biden told CNN's New Day that there's no reason for him not to run and even hinted at the core of his would-be campaign. There may be reasons I don't run, but there's no obvious reason for me why I think I should not run. ... For me, the decision to run or not run is going to be determined by me, as to whether I am the best-qualified person to focus on the two things I've spent my whole life on — giving ordinary people a fightin' chance to make it and a sound foreign policy that's based on rational interests in the United States. In February, Biden made stops in Iowa, New Hampshire, and South Carolina, three states that host the first primaries and caucuses and determine the momentum of the rest of your campaign. Biden traveled to these states officially to promote Obama's agenda, but it's highly unlikely that a politician would visit these three states with no ulterior motive, especially the year before a presidential election. I've been here a lot, I have a lot of friends. I'm going to see some of my friends [who] are still in the Legislature and they're here today. But no, I'm not doing any organization if that's what you mean. I met with old friends like Kevin McCarthy and the newest, youngest state rep who was just elected who worked on one of my campaigns early on. That's a family personal decision that I'm going to make sometime at the end of the summer. In January, during an interview with ABC's George Stephanopoulos, Biden confirmed the possibility of his run. He also seemed to think he and Clinton — who he called "really competent, capable person and a friend" — had pretty equal chances. Yes, there is a chance. ... I think this is wide open on both sides. Even after Clinton announced this past Sunday, Biden remained undaunted, though still undecided. He told reporters at a roundtable discussion at the White House on Monday that he had not thrown in the towel.